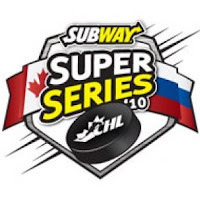 The Subway Super Series is part international spectacle – highlighted by the play of All-Star teams from the CHL and Russian junior leagues – and part evaluation tournament for Team Canada’s World Junior Championship roster. Game one of the six-game series took place Tuesday night, with Russia winning 5-4. Things will resume later today with the final game against the QMJHL, then things move on to the OHL on Thursday. They’ll conclude with a two game series vs. the WHL next week. As reported previously, a total of six Kings prospects will be competing in this series. Defenseman Nic Deslauriers (drafted in the third round, 2009) and goaltender JF Berube (fourth round, 2009) are part of the Quebec team. While, forward Maxim Kitsyn (sixth round, 2010) is skating for Russia. In the opening game Kitsyn had two goals, one assist and finished with a plus-2 rating. Deslauriers had a goal and was plus-one. Deslauriers filed a game report with us yesterday. Now, we’re back with comments from Berube, who played the second half of the first game – stopping 14 of the 16 shots he faced. MM: Game one was your first experience in the Super Series. Overall, how did you enjoy it and was it what you thought it would be? JFB: I didn’t really know what to expect. I really liked it, even though I didn’t get as much of it as I wanted. But, just being there was great. Did you feel any extra pressure knowing that the Team Canada scouts were watching? Not really. I was just trying to play my game. I tried to focus on the little things, keeping my game as simple as possible. I tried not to add any extra pressure on myself. You knew you were going to split time with Oliver Roy. How tough was it to come in and play the second half of the game, rather than be the guy that went first? Of course you want to be the first guy because it’s easier to get into the game. When you’re second you get cold and the last time you faced shots was in the warm-ups. So, it’s easier when you’re the first guy. Your team pulled you with about a minute left in the game, hoping to tie the score. Did they get any good chances in that final 55 seconds? I remember one time we got close to putting the puck in the net. But, I think that was the only chance we had. There were two other Kings prospects in the game with you. Russia had Maxim Kitsyn. Besides his three points, how did he look? I noticed his speed. He was just all over the ice. I think he played very well. He’s a skilled guy with a lot of speed. He showed everybody what his game is about and who he is. On defense, the Quebec team featured defenseman Nic Deslauriers. He had a goal early in the game. Overall, how did he play though? I think he had an awesome game. He played really well. He was probably one of the top defenseman on the team. He did what he does best, he played both ends of the ice really well. From what he told us, you guys have become friends somewhat after meeting at Kings camp. What’s going to happen when you guys play each other this weekend (Montreal @ Gatineau)? We try to keep in touch as much as possible, once or twice a week – just to see how things are going. We were talking about the game on the plane ride up (to the Super Series). To play against each other is going to be fun. We were making jokes about it. He said he would score on me and I said ‘no’ I would stop it. We were laughing quite a bit about it. Things seem to be going well with Montreal (Juniors). The team is batting for the divisional lead and you have 8 wins in 11 starts. Overall, how are feeling this year and what areas are you working on improving right now? I think overall we have a good team. My d-men are doing a really good job in front of me. They’re making it easier for me to see the puck and stuff like that. I’m just trying to improve my game around my net. I’m trying to focus on all the little details I can improve – like my rebound control. Overall, the whole team is helping me with my progress. Back to the Super Series, what adjustments does the Quebec team need to make tonight to beat the Russians? I think it was only a question of execution. In the first game, it was the first time that most of those guys were playing together. So, it’s just a question of execution. Now that they’ve played together and practiced together, I think it’s going to be a lot better. They need to continue to pressure them (the Russians) and just hit them because they don’t like to get hit. So, have a physical game and use your speed. Thanks to JF for checking in. We’ll have more on the series as things progress. For your reference, here are some game one links: box score and video highlights (including the goals by Kitsyn and Deslauriers). Game two starts tonight at 4pm PST inside the Marcel Dionne Centre in Drummondville, QC. You can watch the game for free online (click here for details).